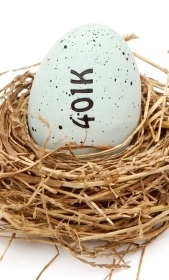 Many employer-sponsored plans have loan provisions. If you roll over your retirement funds to a new employer's plan that permits loans, you may be able to borrow up to 50% of the amount you roll over if you need the money. You can't borrow from an IRA — you can only access the money in an IRA by taking a distribution, which may be subject to income tax and penalties. (You can give yourself a short-term loan from an IRA by taking a distribution, and then rolling the dollars back to an IRA within 60 days; however, this move is permitted only once in any 12-month time period. There are several choices investors have when rolling over money from one plan to another. Since each choice has it's own implications, it is recommended that you discuss and compare all potential fees, expenses, commissions, taxes, and legal ramifications with your qualified advisor before making a rollover decision.